Live supplements can help to support the many good and beneficial bacteria that are an integral part of the intestinal iract. This Lamberts formula contains livelactobacillus acidophilus and bifidobacterium, both are species regarded as being beneficial. Suitable for those whose gut flora is unbalanced. 1 capsule contains 10 billion live bacteria*. Can help with IBS and bowl disorders associated with increasing age. Helps the body fight and deal with stress and illness. Ideal for when travelling overseas. Our digestive system is colonised by billions of bacteria and most of them are harmless. During times of stress, travel and illness, changes in the diet, and taking antibiotics, the unfriendly, pathogenic bacteria sometimes overwhelm the friendly bacteria. 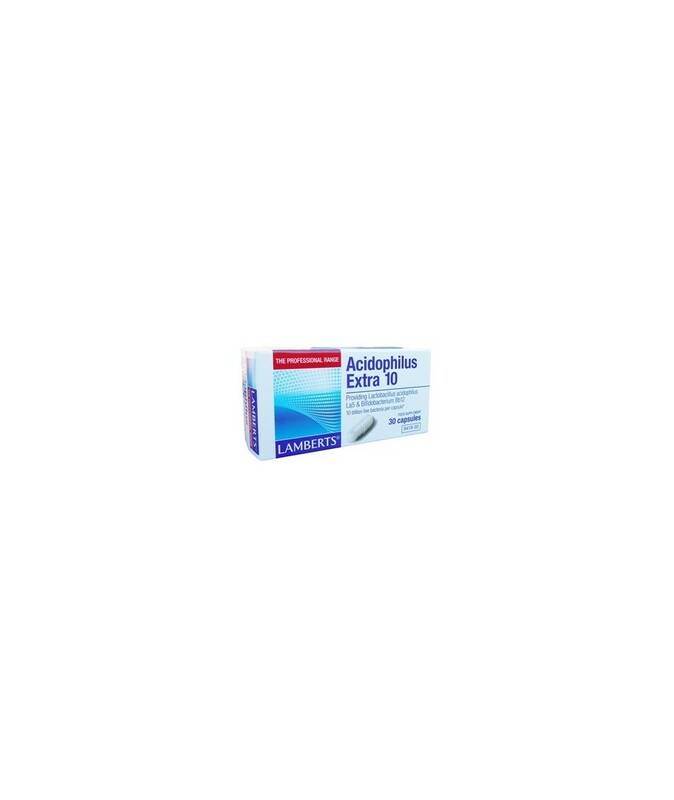 Lamberts acidophilus extra 10, is one of the UK's strongest probiotics. Each capsule contains 10 billion friendly bacteria (at the time of manufacture), with the advantage that only one capsule per day needs to be taken. The bacteria in acidophilus extra 10 are freeze dried with an acid stable polysaccharide matrix which surrounds the bacteria, helping to protect them from the highly acidic conditions they encounter in the stomach. This product is stored in refrigerated conditions until despatch to ensure maximum potency. The special pot also contains an inbuilt desiccant, as viability of probiotics is largely determined by the moisture content of the atmosphere surrounding the capsules. The packaging and the inbuilt desiccant protects the product under 20 degrees centigrade, however it is recommended that if going aboard to destinations where temperatures reach over 20 degrees centigrade, to keep the capsules refrigerated. 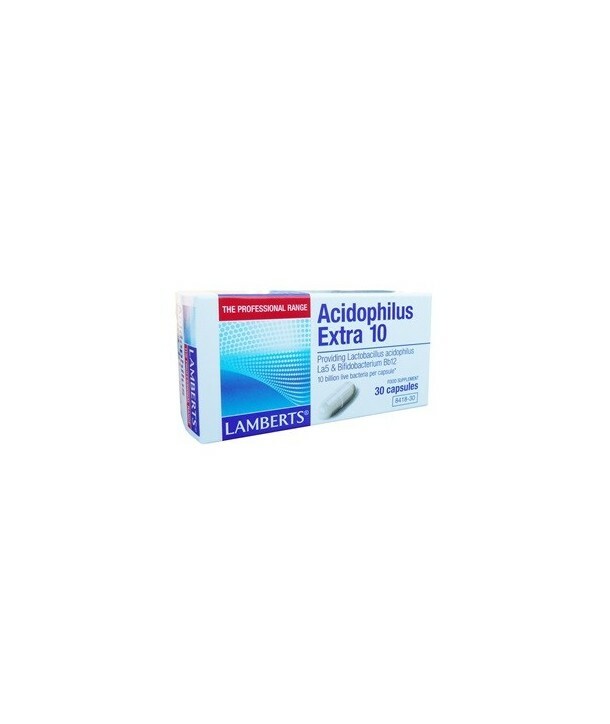 Lamberts acidophilus extra 10 is also available in a 60 capsule pot. 1 capsule daily with a glass of milk or a glass of water or with a meal. Take at least 2 hours after antibiotic medication. Do not swallow capsules with hot drinks; heat kills bacteria. Lactobacillus Acidophilus La5 and Bifidobacterium Bb12 providing 10 billion Live Bacteria*. Encapsulated with: Capsule shell (Hydroxypropyl Methylcellulose, Colour: Titanium Dioxide), Dextrose, Potato starch, Cellulose, Magnesium Stearate.